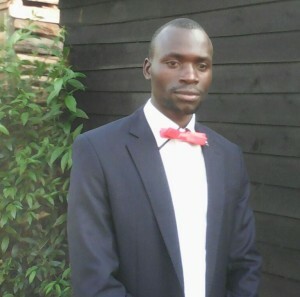 Egide Ndagijimana was born in 1989 in Nyamasheke District, ruharambuga village in Rwanda. He completed his high school studies at the Group Scholaire de Nyamasheke. Unfortunetly he wasn’t able to take his studies further due to lack of funds. Egide was amongst the selected youth who were trained in the youth champion program that was organised by The Aegis Trust in 2014. They were trained in leadership skills, advocacy, continuum violence and continuum of benevolence. These trainings aimed at nurturing the youth about peace building and encouraging them in carrying out peace building activities. After these trainings, they are required to start up peace building activities as well as projects in their perspective communities: Egide started up a club called ‘’urungano rubaga amahoro’’ which has 43 members. He hoped that by starting up this club, he would be able to have a positive impact in his community and engage his fellow youth in peace building activities. Egide and his club members began by constructing two houses for two genocide survivors, Nyirahabimana Regine and Stansilas Ngarukiye in the Munini sector, Nyamasheke district. ‘’ I am grateful for the act that these young people did and I cannot seize to encourage them to do exceedingly to what they have done and mentor their fellow youth.’’ Ngarukiye Stansilas, a Survivor of the Genocide. The Youth in Egide’s community also organise friendly football tournaments frequently and plays in different areas; these gather over 100 people. Egide and his young supporters use these types of gatherings to also teaching about peace building, its activities and creating awareness about the roles of the youth in peace building. ’’ “Being part of the youth champion programme was the motive behind my success in projects and activities regarding peace building. This has also enabled me to train to the youth about peace building.” Egide Ndagijimana.